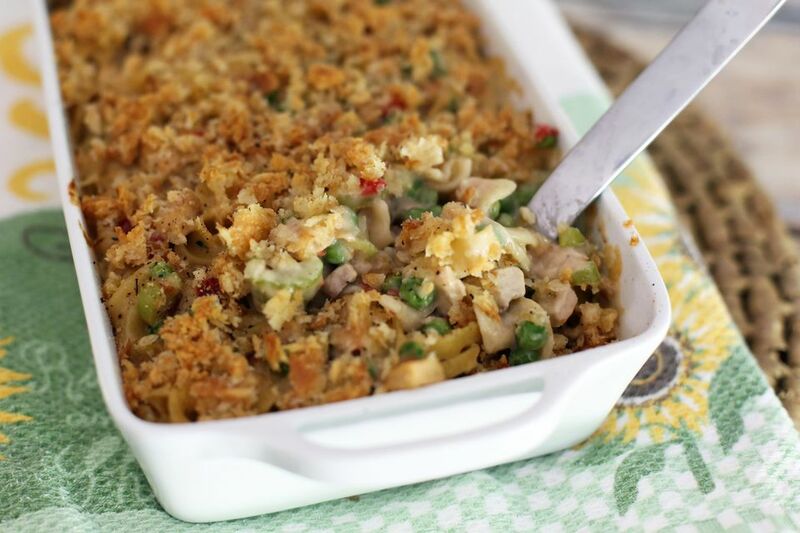 This pork and noodle casserole is an excellent alternative to roasting or baking pork loin, and it makes a delicious one-pot meal. The pork is cubed and briefly browned before baking it with the noodles and simple sauce mixture. Peas add color and flavor to this tasty dish. This casserole can be prepared a day ahead of time. See below for make-ahead tips. Heat the oven to 375 F. Butter a 2 1/2 to 3-quart baking dish. In a large skillet or sauté pan over medium heat, brown the diced pork in the olive oil. Add the chopped onion and sliced celery and sauté for about 3 minutes longer. Add salt, thyme, pepper, condensed mushroom soup, and water. Cover, reduce the heat to low and simmer the mixture for 1 hour. Meanwhile, just before the pork mixture is finished cooking, prepare the noodles. Cook the noodles in boiling salted water following the package directions. Drain in a colander and rinse briefly with hot water. Add the cooked noodles, peas, mushrooms, pimiento and shredded cheese to the pork mixture. Transfer the mixture to a lightly buttered large shallow baking dish. Combine the soft bread crumbs with the melted butter; sprinkle over the top of the noodle mixture. Put the casserole in the preheated oven and bake for 30 minutes. To make the casserole ahead, prepare the casserole, cover the dish tightly with foil, and refrigerate overnight. Take the casserole out of the refrigerator about 30 minutes before baking. Remove the foil and bake as directed. To make breadcrumbs ahead, cut or tear fresh or day-old bread into smaller pieces and pulse briefly in a food processor or with an immersion blender to make coarse or fine breadcrumbs. Freeze any crumbs you won't be using right away. When you need a cup of crumbs to top a casserole or use in a recipe, thaw them briefly before using. *The casserole can also be made with cooked leftover pork. Just dice the meat and add it to the sauteed onion and celery mixture. **Feel free to substitute linguine, fettuccine, spaghetti, or another type of noodle for the wide noodles in this recipe.